Melbourne's Bayside is home to a number of excellent cafes and restaurants and if it's Thai you fancy, you will not be disappointed by the choices available. Neo Thai in Bay Street Brighton is one option and I recently dined there with two girlfriends for the first time in a number of years. Since my last visit the décor has been modernised. The traditional Thai statues and ornate gold paintings have been replaced by beige tones and surprising art works such as beach scenes. The waitresses however still wear traditional Thai outfits of Red knee length silk pants and ornate white lacy tops. Something else that had not changed since my last visit was both the overall quality of the food and the very reasonable pricing. For $25 each (we brought our own champagne) we were able to eat both entrée and main meal. Our stomachs were full and there was still food left on the table. Prawn crackers were brought to the table as soon as we sat down. They tasted fresh and kept the hunger pangs at bay whilst we decided on our substantive meals. Each of us opted for the mixed platter entrée ($11) which consisted of a Thai Fish Cake, Curry Puff, Chicken Satay, Vegetarian Spring Roll, Chicken Spring Roll and Prawn cutlet ("Goong Hom Pa"). The entrée was not only delicious but could easily have been shared between two. For our main meals we shared an almost compulsory Green Chicken Curry, and a Prawn Pad Thai accompanied by rice and Roti Bread. The curry was fragrant, attractive and lived up to expectations. The Pad Thai disappointingly only provided one prawn each but was still enjoyable. As my friend said on the night, "The service leaves a little to be desired but the food makes up for the service". 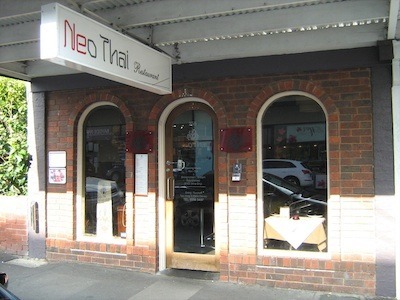 So if you are after a quick, cheap, tasty traditional Thai meal and are in the Brighton area, try Neo Thai restaurant. You will walk out with a satisfied and full stomach but will still have some money left in the wallet. Why? Yummy food, generous servings, great prices. When: Lunch Wed - Fri 12.00 - 3.00pm; Dinner Mon - Sun 5.30pm - 10.30pm. Cost: We spent $25 each including corkage.